CLEVELAND (CNS) — Wiping sweat from his brow in the stifling heat, parishioner Wojtek Fleszar held up his rosary from atop the pulpit near the main altar of St. Casimir Church, under the mural depicting God as king of creation and Jesus as savior of the world, inviting people to pray. The congregation of more than 1,000 packed into the historic 94-year-old church on Cleveland’s east side stood, made the sign of the cross in Polish and began reciting a decade of the rosary. The unified voice of prayer July 15 was the first offered in the ornately decorated church in more than two-and-a-half years. The prayers served as a prelude to the first Mass in St. Casimir since Nov. 8, 2009, when the parish was suppressed under a diocesan reconfiguration plan that saw 27 parishes close and another 41 merge to form 18 new parishes. Fleszar, 37, a native of Poland, was wearing a white shirt and a red tie — the colors of the Polish flag. He told the congregation he prayed the rosary every day, hoping that his beloved parish would reopen and he thought the rosary should be the first prayer offered as the church reopened. St. Casimir and St. John the Baptist Parish in Akron were the first of 11 parishes in the Cleveland Diocese to reopen with Mass July 15. All but one of parishes were expected to reopen by the end of August under a decree from the Vatican’s Congregation for Clergy in response to parishioner appeals of a plan undertaken by Bishop Richard G. Lennon. Tina Girod, a fourth-generation member of St. Casimir, drafted the appeal to church officials that resulted in the reopening. She told Catholic News Service the chance to resume worshipping in the church was a long time coming. “It shows how one person’s actions can change history,” Girod said as she greeted longtime parishioners and friends who once lived in the neighborhood around the church that Pope John Paul II visited as the archbishop of Krakow in 1969. 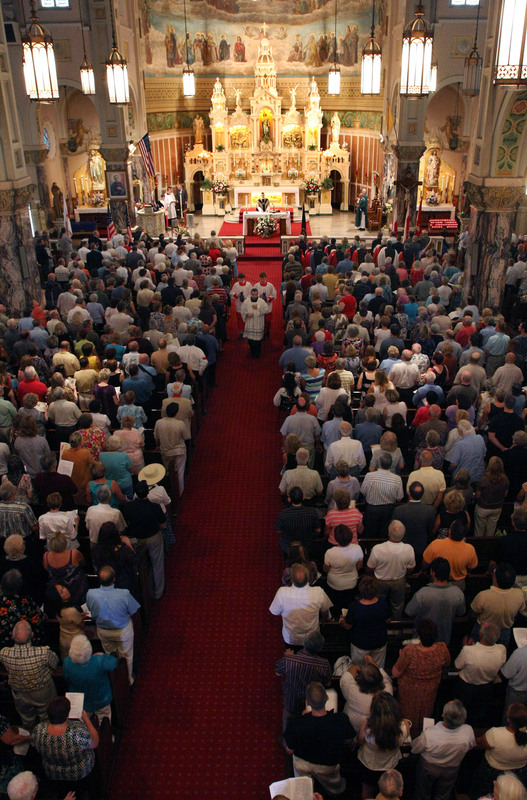 Polish-American pride filled the church as people began arriving an hour before the start of Mass. The congregation applauded as representatives of veterans organizations, the Knights of Columbus and parish groups entered the church behind the Polish and American flags. The processional included parishioner Wieslaw Adamczenski, who carried a flag emblazoned with the logo of the Solidarity labor movement that eventually helped overthrow the communist-led Polish government. Father Eric Orzech, St. Casimir’s new pastor and pastor of the Shrine Church of St. Stanislaus in Cleveland’s Slavic Village neighborhood across town, welcomed the congregation in both English and Polish. As Mass started he blessed water to be placed in fonts at the entrances of the twin-towered church. In accordance with Polish tradition, he sprinkled salt in the water to represent its purification. In his homily, Father Orzech thanked those who never gave up on reopening the church. He stopped short of calling the reopening a miracle, as some parishioners have. Current and past parishioners came from far and wide for the liturgy. Father Orzech said the true test of the parish’s spirit will come after the Mass, when the congregation is likely to be smaller and the rhythm of weekly worship develops. Parishioner Edward Kruszynski, 84, whose father and aunt helped build the church in 1891, was pleased to return to the parish in which he grew up. Lauri and Mark Powaski, members of St. John Vianney Parish in suburban Mentor, decided to attend the Mass for the parish’s reopening with their two young sons to maintain their ties in the Polish community. Pointing to relatives in three surrounding pews, Mark Powaski said his parents and grandparents lived in the St. Casimir neighborhood and were active members of the parish over the years. “I’m very excited to see it opening it up again. It was sad to see it go,” he said.